Physics describes both the terms as interrelated. Magnetism and electricity are like two sides of the same coin, because a changing magnetic field creates electric field and vice-versa. 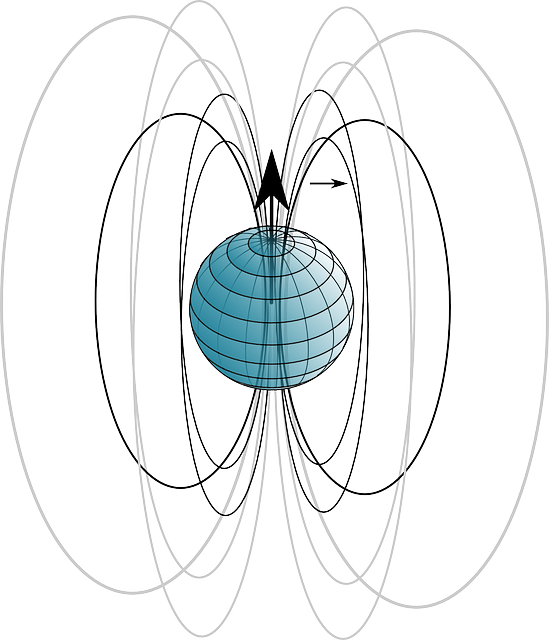 Take a magnet, for example, and move it around you and all of a sudden you surround yourself with an electric field. Both are invisible forces that coexist and we use these forces almost every day. Almost every item you come across on a daily basis – from a fan to your vehicle – owes its manufacturing to electrical power. Without electricity, life would be impossible and we’d be living in the dark. Electricity has been powering our homes since the late 1800s and since then abetting the development of every major technological innovation we rely on today such as phones, computers, appliances, and more. We use electricity every day without even thinking about it. When we flip a switch to turn on the lights, ring a doorbell, switch on the television, or drive in a car, electricity and magnetism are involved. We don’t realize it but magnetism and electricity are related because we couldn’t generate electricity without magnets. And the interaction between these two forces is called electromagnetism. The fact is magnetism and electricity, and the relationship between the two is fundamental to how the modern world works and how are we totally dependent on them for almost everything. These invisible force fields are almost impossible to describe adequately in verbal terms. Physics describes these two terms in two related ways. The movement of electrons or electric charge is called electricity. People often think of electricity as modern day discovery. And they are not wrong. It is electricity that powers everything from your phones and computers to home appliances and vehicles and even satellites. The great scientists who solved the mysteries of electricity were the same people who harnessed the power of electricity to use it on a very large scale or to make the lives of millions of people easier than ever. It wasn’t until the seventeenth century that people began to understand what caused electricity and William Gilbert was actually the first person to use the word electricity. Electricity has been around since ages and we have been using it every day since then. Magnetism is a physical phenomenon, a byproduct of electricity which is produced when electric charges begin to move which results in attraction and repulsion between objects. Consider a magnet that attaches to a refrigerator door due to the magnetic properties of the door and the magnetism of the magnet. The magnet’s ability to attract ferrous objects from a distance has captivated countless curious minds over two millennia. It is magnetism that makes magnets stick to other magnets or metals, such as iron. Materials that stick to magnets are called magnetic. However, the force of magnetism doesn’t work on all metals. For example, magnets do not work with copper and aluminum because they are not magnetic. The movement of electrons or electric charge is called electricity. It is more like a phenomenon that occurs due to electric charges. It’s an invisible force that occurs due to the change in electric charges. Electricity is what keeps the lights on or the television running or makes the machines working. Electricity is in every object around you and it’s even in you. Magnetism is an interaction between moving charges. And materials that can be magnetized to a certain extent by a magnetic field are called magnetic. It is a byproduct of electricity which occurs when electric charges begin to move or change. The key difference between magnetism and electricity is their presence. Electricity is defined as the flow of electrons or electric current through conductors – materials that allow free movement of electrons – which include most metals. 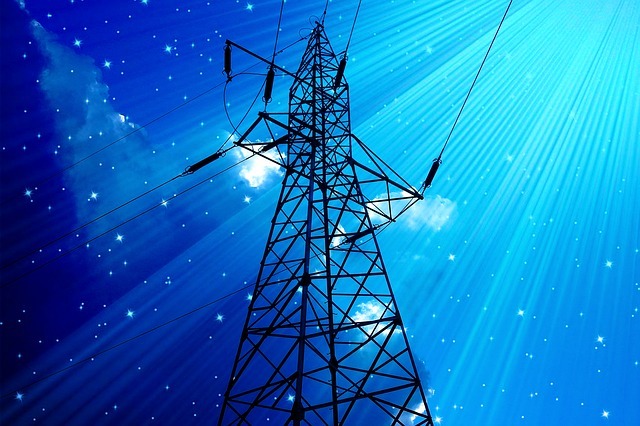 Other materials make it difficult for electrons to move freely, and are called insulators. It is present where there is a static charge or presence of moving charges. Magnetism, on the other hand, is caused by the motion of electric charges so its presence can only be felt where there are moving charges involved such as a compass needle or the magnet in a fridge. Electric forces and magnetic forces seem similar in many ways. Both can be either attractive or repulsive, but both the forces are intimately related to the property of matter called charge. However, this seeming symmetry is broken by the existence of electric monopoles and the absence of magnetic monopoles. Electric monopoles do exist in the form of particles with positive or negative electric charge, such as protons or electrons. On the contrary, magnetic monopoles do not exist because magnetic charges are produced in opposite pairs making magnetism relatively different than electricity. Magnetism and electricity are related terms, more like two sides of the same coin because a changing magnetic field creates electric current and similarly, a changing electric field creates magnetic force. Both are invisible forces that coexist and the relation between them is fundamental to the conveniences of the modern world. We use electricity every day to power almost everything we need on a daily basis. But what you don’t realize is when you flip a switch, electricity and magnetism both are involved. And the interaction between them is electromagnetism. This is why physics refers to both the forces together, rather than separately. Both are different aspects of the same things but slightly different. Sagar Khillar. "Difference Between Magnetism and Electricity." DifferenceBetween.net. 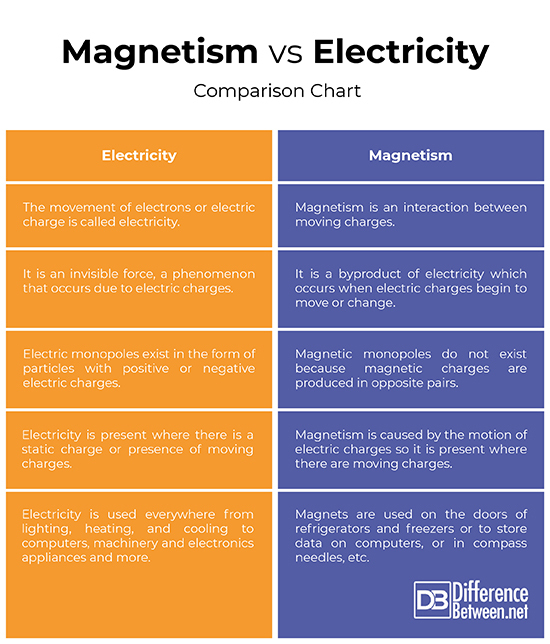 September 28, 2018 < http://www.differencebetween.net/science/difference-between-magnetism-and-electricity/ >.